All children are taught in history class about the Eureka Stockade but they do not learn about the Darwin Rebellion. The Northern Territory was annexed by South Australia in 1863. In 1911 the federal government took control of the NT. Dr John Gilruth was appointed administrator. He had great plans to develop the territory, but he was aloof and would not listen to the community. The administrator was involved in opening a meat works and would not negotiate pay. Consequently Vesteys Meatworks failed. On December 16, 1918 Dr Gilruth refused to allow two bartenders working at the Victoria Hotel the night off to go to a party celebrating the end of WWI. The union leader Harold Nelson went to the police station and got a permit for a protest. 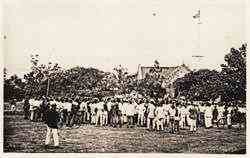 A month after the hotel incident a group of men marched from Vesteys Meatworks to Government House. The small group of protesters grew into a crowd of thousands. Things got out of control. People demanded the resignation of the administrator. Dr Giruth came out and spoke which made matters worse. The crowd moved into the grounds of Government House and an effigy of him was burned. To quell the disturbance the Royal Navy took control to protect the administrator and he remained a virtual prison there for the next two months. Dr Gilruth quietly departed in the night, late February. The situation remained bad for Territorians. Strikes continued. People left to pursue work elsewhere. The only real benefit was that the NT gained a non-voting seat in the federal House of Representatives. There can be no doubt that other factors contributed to the rebellion. The price of beer had risen by 30 percent from 1915 to 1918 due to nationalizations of hotels in Darwin. Legislation in 1911 preferenced white workers over Chinese. This strengthened the trade unions. what darwin rebellion curious darwin abc news australian broadcasting corporation main content abc home open sites menu enter key open tab key navigate abc home news iview tv radio kids shop more change mobile view close menu log search set location local news weather weather news home politics world business sport science health arts analysis fact check topics curious darwin breaking news nationals mp rew broad not contest federal election next year print email facebook twitter more darwin rebellion georgia hitch updated wed 1 52am wed 1 dec 201 1 52am space play pause mute left right arrows seek arrows volume rewind seconds next live 00 00 00 00 0 closed captions settings fullscreen video darwin rebellion curious darwin investigates abc news related story darwin box jellyfish actually go june september related story why darwin dominated air-conditioned concrete bunker-type houses related story why hasn't darwin embraced solar power help locals reduce power bills related story why there malaria northern territory australian students learn famous eureka stockade ballarat miners rebelled against british colonial authorities 1 but darwin rebellion began dispute two bartenders attend party celebrating end world war ended two-thirds city population chasing administrator northern territory away his effigy burned but many have never heard we decided take closer look story part curious darwin new series you ask us questions you vote favourite we investigate you submit question vote next topic here 1970s brian watson asked research event known darwin rebellion abc tv but mother nature unexpectedly put his plans hold brian working administration darwin hospital time but said his brother-in-law abc veteran journalist trevor watson had asked him he would look rebellion began make progress then cyclone tracy hit we lost work we'd done he said abc darwin downgraded really got forgotten but always thought fascinating subject now more four decades later he hopes curious darwin finally help him find more information rebellion years making photo group few hundred men gathered government house demanding dr gilruth resignation rummaging northern territory archives listening firsthand accounts incident reading renowned territorian frank alcorta oam take rebellion started get better idea fuelled commotion december 1 191 there seemed three key issues made territorians blood boil nt being handed back commonwealth 191 leaving territorians unpresented highest level nationalisation darwin hotels 191 191 led jump price beer 30 cent didn't sit well town known its love drinking. ongoing industrial disputes implementation white australia policy 191 mandated white workers had preferenced chinese migrants were paid less gave unions unprecedented bargaining powers ted egan former nt administrator recently wrote book dr john gilruth territory administrator commonwealth representative north state governor time rebellion he told me three decisions were made federal government top end workers directed their ire towards scottish-born veterinary scientist dr gilruth times gilruth blamed … he carrying out the federal government mr egan said photo harold nelson negotiated number pay rises workers threatening taking strike action supplied national library australia beginning his plans went awry wrote historian alan powell territorians federal government alike held unrealistically high hopes economic development yet half expected failure seen have been result earlier efforts south australia territory thus every setback doubly condemned he wrote biography dr gilruth nt annexed south australia 1 wasn't transferred commonwealth control 191 gilruth did his best promote agriculture mining initial doubts development meatworks darwin giant english firm vesteys proved disappointing mr powell said outbreak world war august 191 already wavering commonwealth government lost interest territory development dr gilruth seen arrogant insensitive local community mr powell wrote he went darwin predisposed treat chinese reserve aboriginals heavy-handed paternalism white trade unionists suspicion he said particular he said dr gilruth constantly confronted harold nelson man mr alcorta describes undisputed boss labour movement territory arguably biggest confrontation industrial dispute vesteys meatworks 191 series failed pay negotiations partially closed putting hundreds people out work weight public frustration fell upon gilruth quite unjustly yet his own character helped bring result mr powell said divisive administrator photo dr gilruth territory first arguably controversial administrator supplied northern territory library despite being warmly welcomed he first arrived territory dr gilruth quickly began rub people wrong way not long his tyrannical disposition made him unpopular man territory wrote harold jensen former nt director mines dr jensen despised oppressive dr gilruth much he unsuccessfully tried have royal commission investigation his poor governance photo northern territory times staunchly opposed gilruth administration supplied national library australia didn't help public opinion local newspaper nt times took strong stand against dr gilruth describing his administration curse but not everyone thought dr gilruth manner rough archives listened interview 1 woman called mary perez lived darwin time rebellion knew gilruth family dr gilruth big type fellow broad shoulders but he didn't have face would startle anyone she said think union took much their own hands dr gilruth don't think unjust man he tried please everyone but today nobody would take answer mr egan. dr gilruth tough man deal but he thinks his attitude may have been more product circumstance yes he arrogant yes he autocratic he didn't suffer fools gladly he said soundcloud former darwin resident mary perez dr john gilruth rebellion supplied northern territory archives service but me he always great spotter talented people people think he wasn't fit rule democratic society they were perhaps right wasn't democratic society even mr egan acknowledged though dr gilruth ultimately master his own demise rebellion serious eureka stockade photo march snaked city government house supplied northern territory archives service tipping point darwin workers stemmed incident involving dr gilruth not allowing two bartenders victoria hotel saturday evening off attend local party celebrating end world war mr alcorta said decision painful triviality extraordinary man his intelligence made mr egan describing very stupid mistake wouldn't have made mistake administrator i'd have said where party girls mr egan said little month later mr nelson organised meeting local police he asked granted permission stage peaceful protest city next day december 1 group men marched vesteys meatworks parap past mindil beach smith street ending government house gaining hundreds protesters way confrontation thousand people take government house demand removal his excellency administrator mr egan told me we've got keep mind rebellion confrontation serious eureka ballarat essential good difference lives were lost darwin australian bureau statistics data shows darwin population 1 39 people means two-thirds darwinites — huge proportion — were involved protest gif group burned effigy dr gilruth during protest pause gif 0. mb settings gif group burned effigy dr gilruth during protest initially dr gilruth refused address crowd but persuasion group leaders he changed his mind few minutes he began speak someone group — seem think mr nelson — shouted fence men swarmed administrator grounds there remarkably little violence gilruth pushed shoved couple times he attempted flee house mr alcorta said but few minutes order restored nelson according mr alcorta mr nelson told mob they had done enough show they meant business asked them go home they delayed long enough burn gilruth effigy outside front gate he said inglorious departure photo dr gilruth his family did not leave government house two months rebellion supplied northern territory library disturbance nt times termed royal navy called protect dr gilruth his family they spent next two months essentially living prisoners government house afraid leave property wasn't late february they were shepherded out city middle night mr alcorta described inglorious departure gilruth family quietly boarded hmas encounter morning 20 february 191 sailed away darwin never return. mr egan wrote his book conditions didn't improve workers rebellion strikes continued many left pursue employment elsewhere well driving administrator out union claimed rebellion key driver behind federal government decision create non-voting position nt house representatives 192 mr nelson became first representative territory decades later his son jock nelson held position 1 went become 15th administrator nt — couldn't help but wonder his dad would've thought asked question photo curious darwin questioner brian wilson supplied brian his fiancée cycled top end britain 1 but had abandon their bikes they got india he first lived alice springs then 1 moved darwin he says he'd always been interested learn more rebellion having cut his research short cyclone tracy there were strong overtones boston tea party though true territory fashion beer rather tea ship he said he left darwin brian moved adelaide study biology specialising entomology becoming fascinated insect life he'd discovered territory taught across australia overseas he now retired lives brisbane have question you would answered story came audience question submit yours we answer future curious darwin investigation contact information we'll touch we find answer question name email address phone number submit here questions we've received audience why darwin small compared state capitals submitted months ago has there been increase asbestos-related disease darwin exposure people had during cyclone tracy submitted months ago decides speed limits anything done change them submitted months ago why youth crime high submitted months ago sweating reduce weight way obesity rates lower nt submitted months ago much money nt government spend consultant contracts submitted months ago why doesn’t nt have team afl every state has least two submitted months ago why northern territory home majority australia indigenous population submitted year ago safe darwin submitted year ago topics history community-and-society government-and-politics local-government darwin-0800 nt first posted 1 dec 201 41am tue 1 dec 201 41am print email facebook twitter more more stories northern territory you ask we answer have you always wondered darwin you'd abc reporter investigate more stories why can't top end pipe its abundant water south drought-stricken states matt garrick darwin rebellion georgia hitch strange darwin rooftop boxes josh begbie why darwin australia closest capital city asia offer few international flights emily smith people tropics keep their cool nick hose top stories rew broad leave parliament following dating website scandal government expects voters overlook coalition treatment women sport afl majak daw hospital bridge incident photos you're worried online data trackers try you chuck phone away. hugh paid wotif hundreds dollars night view he got basement why can't top end pipe its abundant water south drought-stricken states landmark dementia study begin human trial restoring cognition mice grazier leaves 9. million charities sport analysis lyon legend grows goat outfoxes king dwarf planet named farout distant we've seen solar system judge backs motion effectively keeps women out tattersall club photos poacher forced repeatedly watch bambi prison illegally killing hundreds deer analysis reason france has more protests germany britain rupert murdoch helped save man death row happens apartment living lands you neighbour hell game thrones characters death comes bloody brutal ways tv boss denied 167m severance package sexual misconduct investigation regional nbn users get faster download speeds but upload speeds halve opinion think elf shelf creepy imagine kids feel photos accused child kidnapper facing threats online behind bars lawyer says economics trees why they're worth billions sport off back slater makes mid-barrel recovery avoid wipeout pipeline masters connect abc news got news tip you have inside knowledge topic news contact abc news inbox top headlines analysis breaking alerts sign more info abc backstory abc teams share story behind story insights making digital tv radio content editorial policies read editorial guiding principles enforceable standard journalists follow features what score cricket australia travelling against india second test perth up-to-the-minute scoreboard keep you posted latest score perth stadium tragic yacht race remembered twenty years ago southerly buster battered sydney-hobart fleet killing six sailors involved still have vivid memory event became race their lives oatlands tourism history closure historic flour mill oatlands hour north hobart knocked wind out tiny town tourism sails locals hoping planned whisky distillery provide lifeline why australia shouldn't sign nuclear ban treaty australia leaders growing pressure sign new treaty nuclear disarmament but won't work leave australia dangerously exposed top stories rew broad leave parliament following dating website scandal government expects voters overlook coalition treatment women afl majak daw hospital bridge incident you're worried online data trackers try you chuck phone away hugh paid wotif hundreds dollars night view he got basement why can't top end pipe its abundant water south drought-stricken states landmark dementia study begin human trial restoring cognition mice grazier leaves 9. million charities analysis lyon legend grows goat outfoxes king dwarf.